TAMPA, Fla. - A third All-America team in three days was made public Wednesday and it was three in a row for UConn senior Napheesa Collier. Collier was named to the five-player Wooden Award All-America team, the Los Angeles Athletic Club announced. It’s her second Wooden selection, having been selected to the 2017 squad. Also named to the 2019 squad were Asia Durr (Louisville), Megan Gustafson (Iowa), Sabrina Ionescu (Oregon), and Teaira McCowan (Mississippi State). The five are finalists for the Wooden Award as Player of the Year, which will be awarded in Los Angeles April 12. The AAC Player of the Year and the Most Outstanding Player of the AAC tournament and NCAA Albany Regional, Collier is averaging an AAC-leading 21.0 points on 61.5 percent shooting from the floor, and 10.8 rebounds. Her 777 points on the season is tied for second with Stewart and her 398 rebounds is a school single-season record. Collier was named to the AP All-America first team Monday and the United States Basketball Writers Association All-America first team Tuesday. 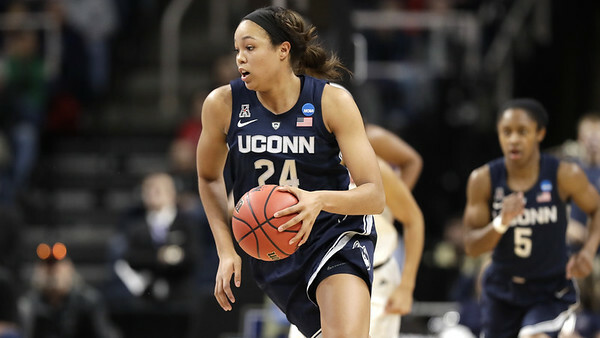 The Women’s Basketball Coaches Association will announce its 10-player All-America team today. Collier, Katie Lou Samuelson, and Crystal Dangerfield are candidates for the WBCA team as all-region selections. Posted in Newington Town Crier, UConn on Thursday, 4 April 2019 21:28. Updated: Thursday, 4 April 2019 21:31.